The Touring Companion is the 200 plus page little brother to the Everyday Companion and includes every known setlist through Halloween 1999. This special edition is highly portable and customized for traveling fans. 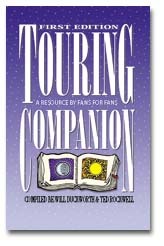 From facts about specific shows, to yearly stats, to photos the Touring Companion has it all. Please allow 4-6 weeks for delivery, price includes shipping and handling.